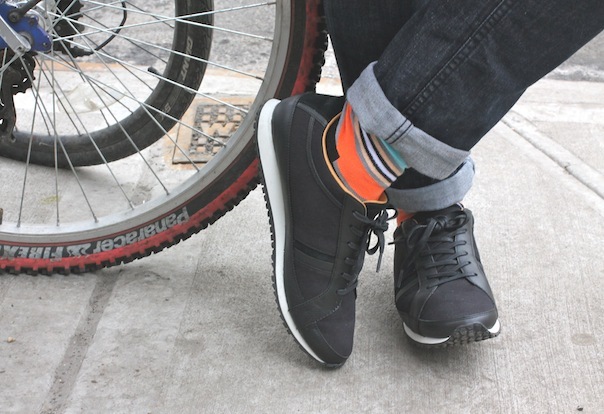 Whether it’s winter, spring or any of other season you can never go wrong with a pair of black sneakers. I enjoy Lacoste’s range of chic and sporty footwear, and a style that recently caught my eye is the Mortain 3 Sneaker. The Lacoste Mortain 3 Sneaker ($134, Nordstrom) is a mixed-material sneaker that features a casual and city-ready runner’s style design that’s features black leather and canvas. The iconic Lacoste crocodile and brand name are also on the upper part of the sneaker, but in all black as well to not disrupt the streamline of the design. Comfortable to be in, I spent my first day in them during the recent New York Fashion Week for a day and night of backstage coverage and street style photography. Posted on March 10, 2015, in Fashion, Outfit, Shoes and tagged Fashion, Happy Socks, Lacoste, Marc New York, Men's Fashion, Menswear, Michael Stars, Opening Ceremony, Perry Ellis, Shoes, Sneakers, Style, Toms, UGG. Bookmark the permalink. Leave a comment.